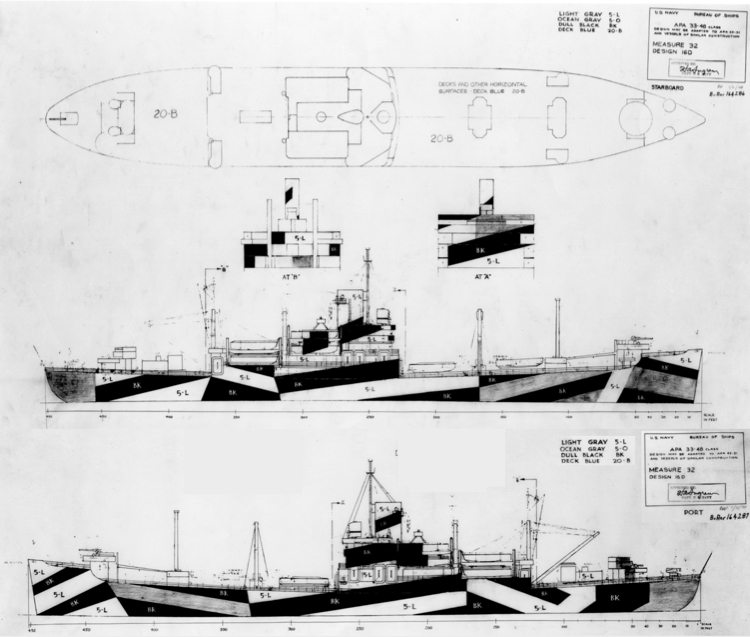 The Design 16D drawing for the Bayfield class attack transports is shown. The standard Measure 32 range of colors: light gray (5-L), ocean gray (5-O) and dull black (BK) vertically and deck blue (20-B) on horizontal surfaces was indicated. A Design 16D drawing was attached to the July 15, 1943, memo to PacFleet for the Farragut class destroyers. Some parts of Design 16D were derived from an earlier pattern used for Measure 16. Design 16D was also drawn for Allen M. Sumner and Gleaves classes of destroyers, Buckley class destroyer escorts, Bayfield class attack transports and for Tacoma class frigates. The cruiser USS Baltimore (CA-68) and the battleship USS California (BB-44) also wore Design 16D. 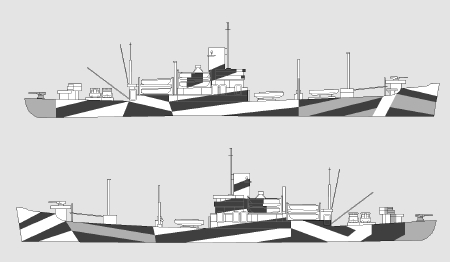 The design drawing for the Allen M. Sumner class varies from this drawing on the port side from the area under the bridge forward, in that the stripes are reversed in direction. Original drawing source: NARA 80-G-164286 and 80-G-164287.